Yesh Atid chairman says Arabs don't want peace. All he wants is a fence between us and them. 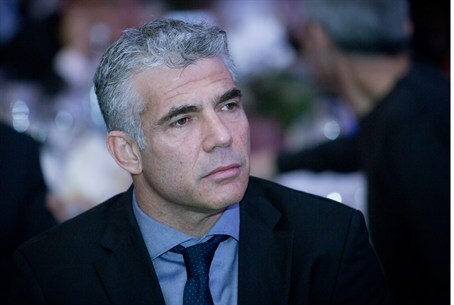 Yair Lapid, the head of the Yesh Atid party, explained Sunday that he has no expectations from negotiations with the Arabs. "I do not think that the Arabs want peace," he wrote on his Facebook page. Lapid said that he does not care what the Arabs want. "What I want is not a new Middle East, but to be rid of them and put a tall fence between us and them." The important thing, he added, is "to maintain a Jewish majority in the Land of Israel." Lapid has said recently that the Left "makes the same mistake again when it negotiates the division of Jerusalem." "The Palestinians must be brought to an understanding that Jerusalem will always remain under Israeli sovereignty and that there is no point for them in opening negotiations about Jerusalem." He added that the Arabs have already understood that Israel will not allow the "right of return" – by which the Arabs refer to a plan for flooding Israel with Arabs – and have given up on that demand. "We need to be clear about Jerusalem as well and then they will understand that this is our solid position." "We have no existence without Jerusalem," Lapid added. "The Tower of David is important for Israel's heritage and existence, because it is more than a tower, it is a symbol. It is more important than the Azrieli Towers," he said – a reference to a well-known group of high-rise buildings in Tel Aviv.